I had the privilege of attending a special opening ceremony of United’s brand new United Club at LAX yesterday. Underscoring the significance of this event, both CEO Oscar Munoz and President Scott Kirby were present and their remarks were noteworthy. The new lounge is 20,000 square feet and is beautiful — sleek, modern, and quintessentially LA: a 1950s style with a great mix of open space and comfort. An outdoor terrace provides great views of the tarmac and even the Hollywood Hills in the distance and the lounge food will be locally sourced. This is certainly a lounge you are going to want to check out. I showed up at LAX around 4pm and was issued a gate pass for the event (side note — PreCheck does not work on gate passes). T7 at LAX is really transforming and the new Club entrance is located adjacent to Gate 71. Guests will be checked in a downstairs lobby and can then proceed upstairs to the lounge. The lounge has ample seating areas, with electrical plugs and USB ports all over the lounge (even under the bar). Off to the left is an area for help with ticketing and flight changes and around the corner are several cell phone cubicles. There is a single small room that could serve as private meeting the space. Unfortunately, the new lounge has no showers in the bathroom, the but the bathroom is sleek and modern with opaque glass windows and high-end Toto fixtures. Showers will be available in the new Polaris Lounge opening next year (in the home of the former International First Class Lounge further down the T7 Concourse). Of course there was a lot of nice food for the event including Greek, Mexican, Korean and Japanese but the food in the lounge will be “real” (no more packaged crackers and cheese), all complimentary, and locally-sourced. The first few pictures below are of food that you will see in the lounge. There were baristas making espresso-based coffee drinks and wow was it good — I skipped the food due to a prior dinner commitment but did enjoy three cappuccinos. Unfortunately, the United Club will not have full-time baristas but will have coffee machines that will dispense an assortment of illy coffee drinks. The best part of the lounge is the terrace — spacious, open, and affording great views. 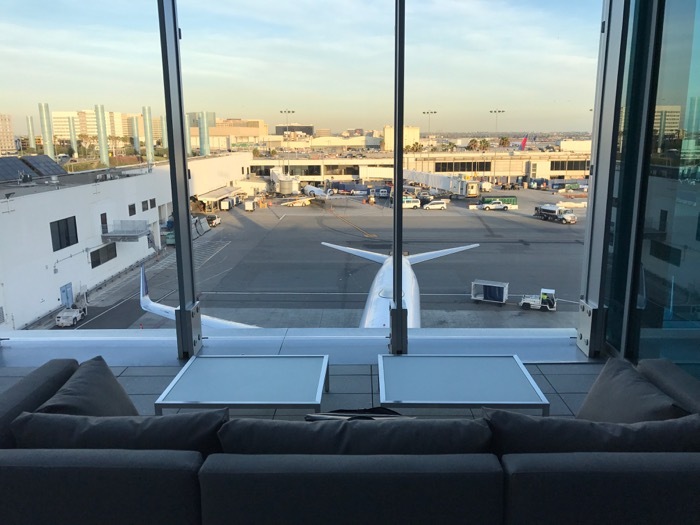 Joining the Star Alliance Lounge in the Tom Bradley Intentional Terminal, there are now two Star Alliance Gold Lounges with beautiful outdoor terraces at LAX. I personally spoke with both Kirby and Munoz and will discuss that in a future post. On the way out United presented me with a “swag bag” containing a United Club pass, United onboard drink voucher, an illy-branded stainless steel coffee cup, two illy pods for a Keurig machine, a nice metal plane-shaped USB drive, and a United silver-colored luggage tag. The new lounge will open to the public on December 06, 2016 and be open from 4:30a – 10:00p each day. You definitely want to visit it! Great review! I look forward to some times in this lounge. Shame they won’t have shower facilities though. Oh well. Looking forward to the Polaris lounge too! Can you access the lounge with a regular day pass without being same day on united? Gate passes never included the status (elite or precheck) of the holder. Not a big deal since no luggage. Just take off you jacket; shoes and slip your phone & wallet into them. Really not a big deal since United Club axed the privilege. I have no doubt that United can carry off the hard product but can they execute on the soft product. In GF through SFO I had problems getting into the GFL coming and going. Thanks ~ Neat piece .. .. Looking forward to the ‘new’ club .. ..